It’s best to begin with a quick definition of Capitalism to identify what we’re talking about below. The first use of the word is attributed to novelist William Thackeray in 1854, and is derived from the French word ‘capitalisme’, defined as ‘the condition of one who is rich’. In essence, it’s an economic system based on private ownership of the means of production (land and capital), for the production and distribution of goods or services for profit. It differs from earlier feudal systems, which even involved ownership of the third essential factor in the means of production: labour. The disintegration of feudalism after the labour shortages that followed the ravages of the Black Death in Europe, between 1348 and 1350, resulted in individuals being able to charge for their labour and move around freely to maximise their income. However, over the following increasingly industrialised centuries capitalists largely re-established their control over labour by offering minimal wages for work undertaken. This is much more easily achieved during periods of labour surplus, prompting Karl Marx to argue that unemployment (a surplus of employees) was an essential component of capitalism. Capitalism has been around in various forms since at least the 17th century (although it can arguably be traced as far back as the pre-Christian Assyrian merchants, who traded for profit) when in Holland, along with riches for the few, the shortcomings of capitalism were highlighted at an early stage: in 1607 a merchant, Isaac Le Maire, ‘played’ the market by dumping stock, so deflating the value, and then buying it back at a discount. Then, in 1636, one of Holland’s biggest exports, the tulip, was associated with an artificial inflation, followed by a collapse in value, that resulted in many people making and then losing fortunes, largely caused by over-speculating in the future values of a product that they weren’t even handling or trading directly. Does this sound familiar? The lesson, of course, wasn’t learned, because capitalism fuels what some would consider a natural inclination for human greed, and so the mistake was repeated again and again, through to the beginnining of the 21st century where we have seen large-scale speculations from hedge funds and investment banks on the inflated value of property mortgages (the inflation of which was partly fuelled by the ready availability of mortgages by institutions willing to take great risk, in the hope of making a financial killing from those not financially well placed to repay them). Inevitably, once again the bubble reached crisis point and burst, resulting in massive mortgage defaults that wiped the (virtual) value from the assets of many of the speculating institutions. It could be argued that the financial institutions were no better than the individuals who defaulted on their mortgage payments, because they too were over-speculating beyond their ability to absorb the potential loss. Indeed, the financial institutions were arguably far more culpable, firstly because they should have known better due to their financial expertise, and secondly because it was the financial system that encouraged individuals to borrow beyond their means in the first place, by the provision of easy mortgages. Now, this may have been all well and good if it was only the speculators who had suffered as a consequence of their own follies. But as we all know, because much of the world, particularly the Western world, is totally geared around the machinations of markets and the speculative value of money and other capital, collapses in the financial system result in a crisis in the entire economic structure, so that as the (virtual) values of financial commodities suddenly decrease due to a collapse in demand (because of an inability to pay for such commodities) institutions and individuals across the globe suddenly find themselves in financial collapse, resulting in large-scale cutbacks and loss of employment. Because employment is, in much of the world, closely associated with the welfare of individuals, this collapse in the job market has caused tremendous hardship for millions, and the resulting reduction in demand for goods, due to inability to purchase them, has created a spiral which further fuels the collapse of companies and job losses. The net result today is a terrible economic mess, where the welfare of millions of citizens has been severely jeopardised, due to reductions in the (virtual) value of money and other capital caused by the foolish speculations of capitalists in the money market. How has capitalism failed us? There is no need to look any further than the big banks to answer this. We have seen above how investors, and in particular the large investment arms of the big banks, were largely responsible for the economic crisis of today: or rather, they are a manifestation of the capitalist system which allowed them to trade, not only in the speculative values of capital, but also the livelihoods of millions of citizens across the globe who are unwittingly caught up in the economic framework which governs their welfare. Indeed, the term ‘service industry’ is surely a misnomer with regard to the banks, because they appear to have become little more than self-serving capitalist institutions. The illegal manipulation of the inter-bank lending rate (LIBOR) and the widespread mis-selling of payment protection insurance are two more significant recent examples. advertising and glamourisation of products such as cigarettes, despite irrefutable evidence of the health-threatening properties of the products. unhealthy additives (e.g. excess sugar, salt and fats) in foods to maximise profit. the recent discovery of horse meat in ‘beef’ burgers (this sort of thing crops up regularly and it leads one to wonder exactly what food manufacturers are getting away with illegally). the wastage of almost 50% of the world’s food production, because it’s over-produced for profit motives but it isn’t ‘profitable’ to redistribute it to the millions of people who starve to death each year. mafia groups such as those involved in the drugs trade, who kill to protect their earnings. production and distribution of armaments which kill people (often innocent civilians) whilst the producers (and distributors, often in the form of nation states) reap financial gain. A recent example is the discovery of illegal 1,000,000 volt stun guns being used in the UK: these weapons are 20 times more powerful than those used by the UK police force, and can seriously maim, but what do the profiteers care? destruction of habitats, and the hunting of animals to near extinction for commercial gain. For example: the white rhinoceros, just because its horns are considered an aphrodisiac, the elephant for its ivory, and the indiscriminate felling of the world’s rainforests. (One must also take into account here the fact that the suppliers (hunters) are often motivated by poverty due to the unfair distribution of wealth). price rigging of essential commodities such as energy and pharmaceutical supplies. withholding of health care on the grounds of cost. the recent PIP breast implant scandal. purchase of parliamentary question time for financial gain (‘cash for questions’) and other corporate manipulation of political systems. printing of lies and half-truths, and intrusion into privacy, by ‘news’ papers, solely to preserve market share. …the list is endless, almost literally, but the few examples cited above will hopefully prove the point. Capitalism: It’s Time To Move On. But let’s not leave this without one further reflection: the vast wealth of imperialist capitalist nations was bought largely at the cost of the exploitation of other people, and other peoples’ resources; these peoples almost invariably suffered rather than benefited from the process, even to the point of their cultures being driven to the point of extinction, and the slave trade is probably its most shameful legacy, and one of the greatest indictments against the whole tenet of capitalism. It’s worth noting here that, as with the Plimsoll Line, the rich slaver ‘entrepeneurs’ resisted the abolition of the slave trade: they were more concerned with their own personal gain than any sense of morality. At this point we should also consider the fact that, in addition to the recognised trade of non-indigenous peoples into forced labour, the conditions of those indigenous peoples who worked in the mines and mills of the industrialised world were in themselves not that far removed from that of slavery, with employers having a large degree of control over the freedom of those they employed, and with the employed having little choice but to accept these conditions in order to provide sustenance for themselves and their families. 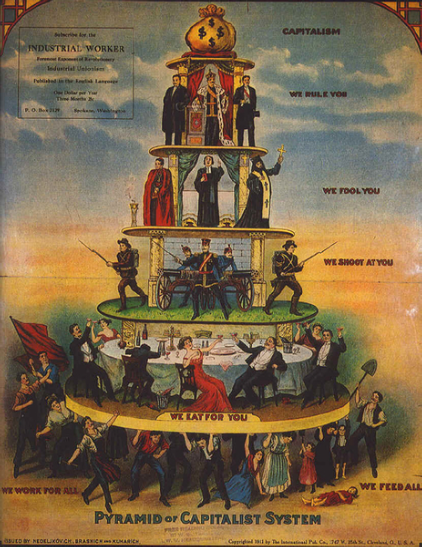 Illustration: the social pyramid according to Industrial Worker, 1911.
implications such as an increased risk of flooding of the surrounding land). Another example which those of us in the ‘developed world’ can see all around us is the excessive use of packaging in order to make products more attractive to the purchaser - resulting in the huge environmental cost of producing that packaging , particularly plastic based packaging, as well as the financial cost (which is passed directly on to the consumer) and the landfill implications for the resulting waste. Consider too the way in which the exploitation of resources such as housing has detrimental social costs: in the current depressed housing market ‘entrepeneurs’ are buying up the housing stock cheaply and then charging extortionate rents for people (often people from a deprived background) to live in them, and threatening them with eviction if they don’t toe the line (or sometimes, even if they do because the landlord sees a bigger financial gain elsewhere): in some ways we are regressing back to the Victorian age - but let’s face it, despite its associations with destitution and workhouses, the Victorian age was a golden era in the annals of capitalism, because the lucky ones made great fortunes. This is one of the greatest flaws in capitalism: its success is based upon some people winning and others losing, because there is not enough wealth to go around, and in any case those with the capital to speculate don’t feel that others deserve an equal share (even though that capital has in many cases been acquired by questionable means, often historically). The resulting divide, as we have seen, is part of what fuels capitalism: there needs to be a surplus of labour desperate to work for whatever an employer will pay them, as well as an endless market for products. The latter can no longer be sustained in a world of depleting resources, and as a result products are becoming increasingly ‘virtual’ commodities such as equities. The cost of this is probably incalculable worldwide, resulting in massive social divisions which fuel seething resentment, crime, and war. These three things were around, of course, before capitalism existed in name, but capitalism fuels rather than quells these flames. There’s also another cost though, more difficult to evaluate: the under-attainment of countless individuals who never have the opportunity to realise their potential as human beings, and the incalculable loss to the human race of such potential. In Britain today the Conservative-led coalition government have presided over changes to the educational system which has led to an increased cost to the individual for Higher Education, making it more difficult for those from less privileged backgrounds to acquire such education: again, this is a return to Victorian attitudes, and whilst education does, in our capitalist-driven society, have a monetary cost, this is not an ethically sound way of determining who should and who should not have an opportunity to realise their individual potential. If one wanted to be really cynical one might suspect that it doesn’t suit the ruling elite for the masses below them to be too educated and be in positions of power that might upset the existing hierarchy - although as an optimist i would suggest that the momentum to overturn this already has too much pace to be driven back. Here is another fundamental flaw of capitalism: those that sing its praises claim that competition is good for the consumer. That might well be the case, but capitalist-fuelled competition is only good for the consumer as long as there’s a profit in it for the producer. Let’s not be naïve: the ultimate aim of a capitalist market is to maximise profit. Therefore, if they offer the consumer a discount, it’s not for any philanthropic reason, it’s simply to maximise profit in the long term, by out-bidding and outsmarting the competition. Again, even amongst producers in the capitalist system, there are winners and losers: as the losers go to the wall, the ‘winners’ have an increasing monopoly. Do the prices remain low then? No! There is no motivation to do anything other than maximise profit by charging the highest price a consumer will pay. Thus capitalism has to be tempered by artificial controls: state intervention, monopoly commissions and the like: these controls are tampering with a capitalist machine because it has failed to the point where it’s patently detrimental to all but the producers themselves. Beware the big advertisers too: many of them spend heavily to ‘educate’ their potential market into believing that their product is superior to its rivals, but ultimately recoup that cost by charging a premium price for a ‘niche’ product or a label that has ‘cachet’. In many cases the consumer has been brainwashed into believing that the product is better than its rivals, and this often enables a producer to supply an over-hyped product that may actually be inferior, costing less to produce, and so maximising profits. Most people who have objectively tasted mass produced and often mass advertised beer, and then compared it with a quality, low volume, and often handcrafted product from a micro brewery, will understand that you most certainly don’t always get a better product just because the advertisers tell you so! Also, large successful corporations seem to think that they are above the law: companies such as Starbucks and Amazon seem to think that they are so big that they don’t have to pay tax: they figure that the fallout caused by bad publicity will hardly put a dent in their market share, and it’s only when they fear that they have miscalculated the consequences that they suddenly become contrite and play by the rules again. For all the reasons cited above, capitalism just doesn’t work: it’s ethically unsound, resource wasteful, and structurally flawed. In the short term a large proportion of people might benefit, although some will always lose - but when the next inevitable boom-bust cycle returns to a ‘bust’ phase; when the next ‘bubble’ bursts, the losers are the vast majority of the populace, and we are seeing that yet again now, as a consequence of the recent banking crisis. Capitalism was a step forward from the often brutal feudalism that preceded it, but it was seriously flawed from the outset, often resulting in a very similar outcome to the feudal system, and is now outmoded. It would be incredibly naïve to think that capitalism will change its spots in the future: if left unchecked, profiteers will continue to seek profit at whatever cost to others. But in a world of depleting resources there is less ‘product’ to go around, and we need to share these resources more equitably. For a chilling look at potential future scenarios, take a look at the science-fiction epics Moon and Soylent Green: if you think these are far-fetched, perhaps you underestimate the lengths to which exploitative people will go in situations where their own well-being is under threat! Horse meat in beefburgers may not be poisonous but was put there dishonestly and thus unethically, and if left unchecked this sort of behaviour would become the thin edge of the wedge. Once again we see how capitalism has to be tempered by artificial controls, or counter measures. To look at alternatives to capitalism is really the subject of a future article, so suffice to say here that many people are now questioning capitalism as a workable structure to carry humanity into the future. One shouldn’t confuse capitalism with enterprise. Enterprise is good: indeed, it’s what has carried the human race forward from our days in the jungle. It’s the motivation for that enterprise that is under question. It surely does the human race a disservice to suggest that people will only be driven to engage in enterprise for selfish gain, and that the bigger the gain the more effort they will put into it. This is partly true, no doubt, because of the way in which successive generations have been brought up, but to suggest that personal gain at the expense of others, which is an inevitable consequence of capitalist enterprise, is something to be condoned is to ignore those in the human race that have offered their skills for the betterment of others without becoming hugely rich: the scientists; the aid workers; the countless volunteers who do unpaid work to improve the lot of others. No, there is another side to the human race which we have perhaps under-‘exploited’ for many centuries: that of goodwill and human empathy. We all want to be rewarded for the efforts we make; but that doesn’t have to be in the form of inflated material riches, which create a multi-tier society and the associated crime, war, and breakdown of social cohesion in which we are all ultimately losers. Article subject to further editing. You can discuss this article on the forums here.